Depart Toronto Flight to Lima overnight in Lima. Following an included city tour, the rest of your day is fee to explore Lima for a little shoe shopping, or a churro stop at Manolo’s perhaps? Or the adventurous can try the local delicacy ceviche and enjoy the nightlife of Miraflores. Overnight Hotel Lima. Morning flight to Cuzco rest of day free to acclimatize and explore Cuzco. Take an optional city tour, visit Sacsayhuaman, or just wander the streets and enjoy one of our most favourite cities. Overnight Cuzco Hotel. Today we transfer to the community of Saccaca in the Sacred Valley of Peru 4 ½ hours from Cuzco. We will meet our host families for the next 5 days and explore our new homes and the community. Overnight Community home stay. Saccaca Community Volunteer Work (B, L, D) We will be volunteering in the Saccaca community 4 1/2 hours outside of Cuzco. Most of our porters for the Inca Trail live in this community and it was a logical choice for our next project. We will be building a local community centre and tasks will include building mud bricks for the project, building, painting, crafts, games as well as many other activities that the whole family can participate in. A chance to get your hands dirty and help out and become members of this community. Overnight Home stay. Cuzco (B) Cuzco Free day to relax and explore the beautiful city of Cuzco after all your hard work. Tour the museums or cathedrals visit some of the nearby Incan sites. Get a massage or just sleep in and wander down to Jack’s for a late breakfast. There is no shortage of things to keep you busy in Cuzco. Overnight Hotel Cuzco. Sacred Valley / Ollantaytambo (B) Today it is time to see the sights, we will depart early and journey through the scenic Sacred Valley. Our tour includes the Pisac Terraces we will learn ancient weaving techniques and head to the “Inca Bar” for some cheecha and a game of Sapo. We will also have the opportunity to pick our “cuy” for a future lunch on the trail. We end our day in the picturesque town of Ollantaytambo. Overnight Ollantaytambo Hotel. Inca Trail to Machu Picchu - (3 Breakfast, 3 Lunches, 3 Dinners) Begin your once in a lifetime journey on the ancient trail of the Incas with a morning trip to km 82, where our hike starts. Local porters and guides ensure that the trip is worry-free. Fascinating ruins and spectacular mountain scenery fill every day of the hike. On our final day, we climb the steps to Intipunku, the 'Sun Gate', and enjoy your first view of Machu Picchu before our tour of the famous Inca ruin. After Free time in Machu Picchu and lunch in Aguas Calientes we begin our journey by train and bus back to Cuzco. Overnight Cuzco Hotel. Cuzco Free day to relax and recuperate after the trail. Maybe do a little more exploring in Cuzco, take in one of the many museums, explore the cathedrals, some souvenir shopping or just relax on a balcony around the square and enjoy the sights. Overnight Cuzco Hotel. Free morning to relax and explore. We will enjoy a unique farewell lunch sampling some of the local Cuzquenian delicacies in a local home. Overnight Cuzco Hotel. Lima/ Toronto - Early morning connecting flight to Toronto. International Airfare, fully escorted from Toronto, airport arrival and departure transfers, all accommodation in comfortable hotels and camping, domestic flights (Lima-Cuzco-Lima), all meals during Inca Trail. Tours as indicated on the itinerary, English speaking local guides throughout, airport and departure taxes, local guides, porters, group tips/gratuities. Incidentals, Insurance, Personal tips/ gratuities, Beverages, Meals not mentioned above. 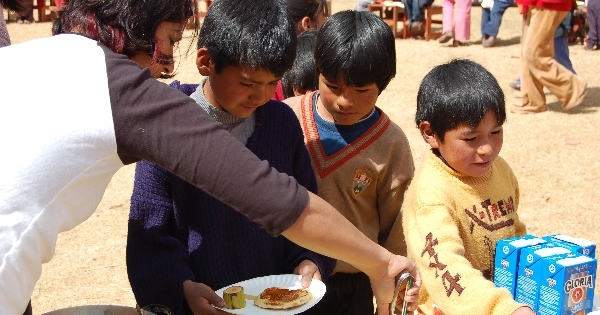 for the children in the Sacred Valley of Peru.